For a long, long while, the DC Comics movie machine has been half-stellar, half-embarrassment. Sure, Christopher Nolan’s Batman films re-energized that character, erasing the sour taste of the 1990s Joel Schumacher sequels (which had in turn wiped out the good will from the two quirky Tim Burton entries). But Superman Returns, Bryan Singer’s 2006 attempt to kickstart the long-dead Richard Donner continuity, suffered from its rehash feel (cataclysmic real estate swindle), a misunderstanding of the character (Stalkerman), and simple boredom (our hero lifted things — he lifted things a lot). And the less said about the Ryan Reynolds-infused Green Lantern, an abortive attempt to mine secondary DC heroes, the better. So the DC record has been checkered at best, with some rough failures mixed in. Meanwhile Marvel, even though handicapped by farming out half their great properties to rival studios, has been running roughshod over the superhero movie landscape, establishing a shared universe that merged in last year’s stellar The Avengers. That movie was a license to print money, and execs at Warner Bros. have to feel like Thomas Edison’s neighbors after he invented the light bulb. Not even green with envy — verdant with it. And yet, with the Caped Crusader again a hugely bankable commodity, all DC has to do to get things up and running is re-establish the other half of the World’s Finest duo. Batman and Superman are like Usain Bolt’s legs: get them pumping side by side in harmony, and you have something transcendent at hand. Enter Man of Steel, a big, brash blockbuster from Zack Snyder, Nolan and David Goyer, which seeks to get DC’s celluloid component sprinting on both legs, with a modern grounding and all the epicness/epicosity/epicitude that cash can buy. The marketing for MoS has been spectacular, starting with the understated dual father teasers attached to last year’s The Dark Knight Rises and culminating in the most recent trailer, which packed so much stunning eye candy, it necessitated an immediate rewatch — if not multiple rewatches. All stops have been pulled out. The anticipation is intense, the hype has reached a fever pitch, and a film can’t possibly live up to all that, can it? The answer is yes, it can — kind of. 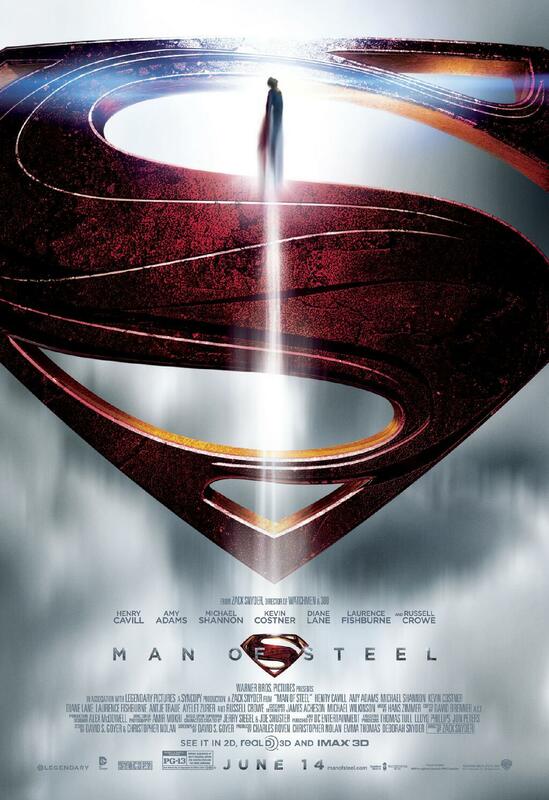 While not utterly recalibrating our view of the modern superhero movie, Man of Steel more than establishes our child of two worlds in the new century. Though the plot is at times leaden, the action is unbelievable — in short, exactly how watching Superman do battle should be. I’ve read a number of reviews that gush as if MoS is the second coming (appropriately enough I suppose, since once again we’re clubbed over the head with Christ imagery, including an extraneous symbol-backed scene in a church). It’s not that. The script is no polished gem. But from the opening moments on the bizarre new Krypton to the last desperate struggle in a decimated Metropolis, this movie makes you believe not only that a man can fly, but that he can rev up the shared universe engine. ← Forget Legos — 100 magnets can work magic, build vague, clunky toys, and wipe data. Enjoy! Hah! I knew it! Underneath that cold, cynical front there was a comicbook loving kid somewhere. After the disappointment I felt with that cardboard tank, which was of no use in punishing enemies or picking up chicks, I finally have something to believe in again. I didn’t think I wanted to see this film. Now? One Of The Best Comic Book Blogs Ever. I just saw Man of Steel earlier this afternoon, and while not quite as enthusiastic as you, I really did appreciate reading today’s post. It’s refreshing to read comic book movie reviews written by people who are knowledgeable and passionate as comic book fans. Thanks. And I understand people’s quibbles with the movie, because I have some of them myself.